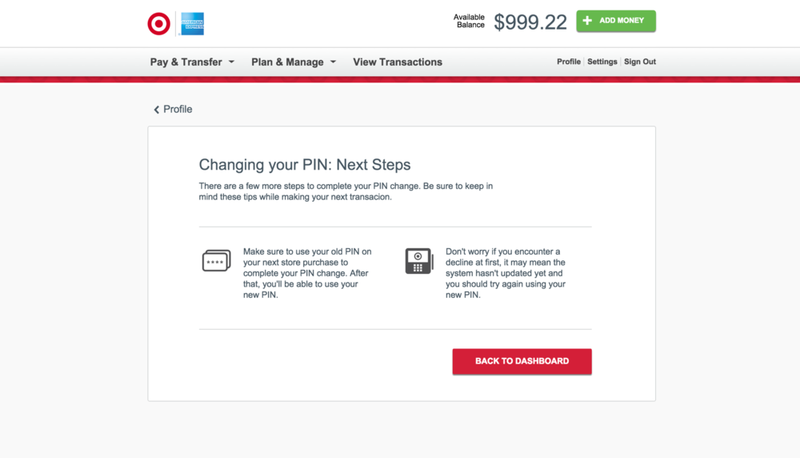 On user’s profile page, a user can select whether they forgot their PIN or if they would like to change their current ATM PIN. A user needs their current ATM PIN to reset, and if they forgot their PIN, they need to answer security questions and can only change their PIN completely. EMV Chip adoption involves changing user behaviors. I began by researching the complex EMV chip card offline and online PIN processes, after which I sketched possible scenarios for a user who begins resetting their PIN online and completes the process in-store or at an ATM. Opportunities to enhance PIN reset education, or gain help from a CCP or Target representative. Additional Edge Cases: Pulling a card out too early, or a server moving offline cause additional problems. be ideal for users to find places to access their account. Additional Edge Cases: Pulling a card out too early causes additional problems, 30% fail rate. Resetting a EMV chip PIN can potentially cause many pain points for our specific user base. By creating an option and pushing for a user to view their PIN online, call volume would decrease and pain points surrounding resetting an EMV chip card would be alleviated. Suggestions: Create a View PIN flow, replace content around “Resetting” with “Viewing,” provide extra education around changing a PIN. I layed out a content matrix (below) to plot out what I wanted to communicate at which user touch point. 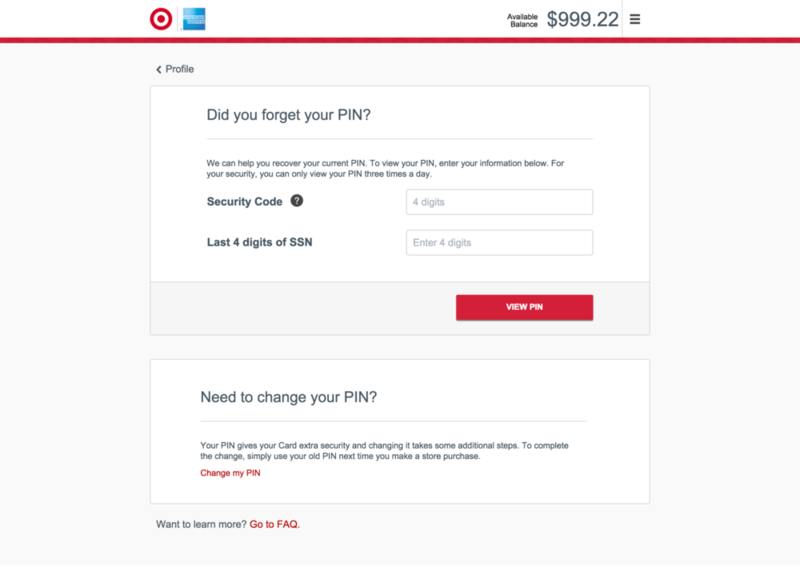 Once the design directions were finalized, I held a workshop with marketing to strategize the tone and voice for a user who wants to recover their PIN versus a user who wants to reset their PIN. After mapping out content and the flow diagram I had a pretty good sense of the structure of the design. By leveraging our existing platform patterns I could jump right in on assembling the visual design with our front-end developer. Because of Risk & Compliance restraints, a user can only view one digit of their PIN at a time online. I pushed the “View PIN” flow with more prominence and hierarchy with a strong call to action that jumpstarts the user into the flow. I provided additional education around what it means to change a PIN, before a user can enter that flow. Additional language about remembering an old PIN and a call to action to view PIN added. Reitering again that there are additional steps for the user to take to complete their PIN change. A break in pattern, a change of layout and icons help drive attention to this. As of October 19, 2015, all new pre-paid Target Redcards' are fulfilled with EMV chip and offline PIN. Our team will continue to monitor call volume to assess pain points and identify how this can scale to other pre-paid cards. The "View PIN" enhancement will resulted in cost savings from reduced call volumes.